Black-eyed peas. A staple in Southern cuisine, soul food in particular. 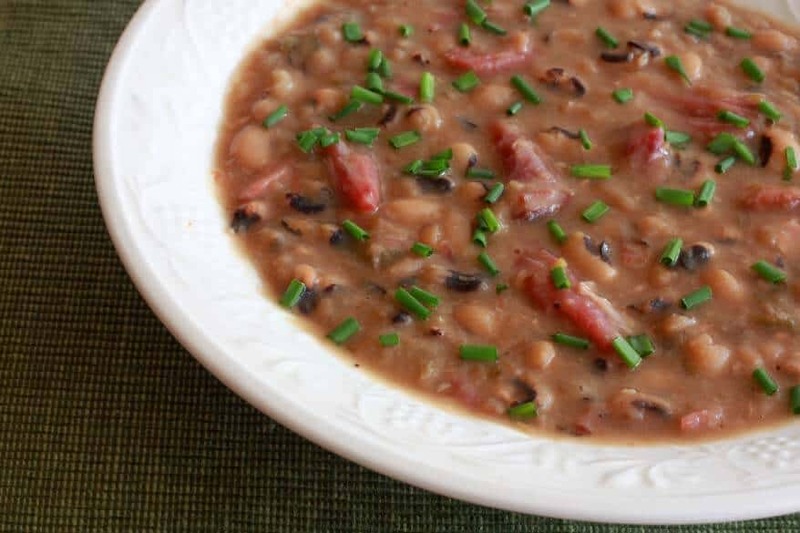 Originating in West Africa 5000 years ago and brought to the American colonies in the 17th century, black-eyed peas are rich in history and have long been thought to bring good luck. 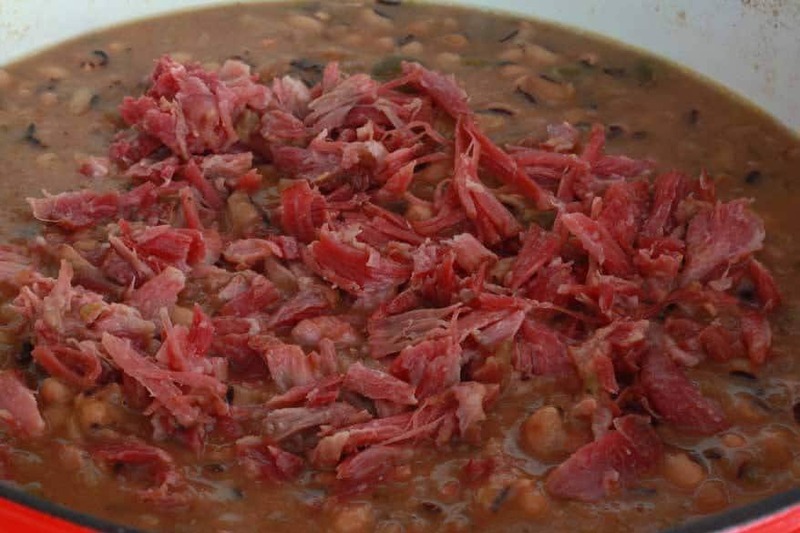 A Southern tradition is to eat them on New Year’s Day to bring prosperity in the new year. 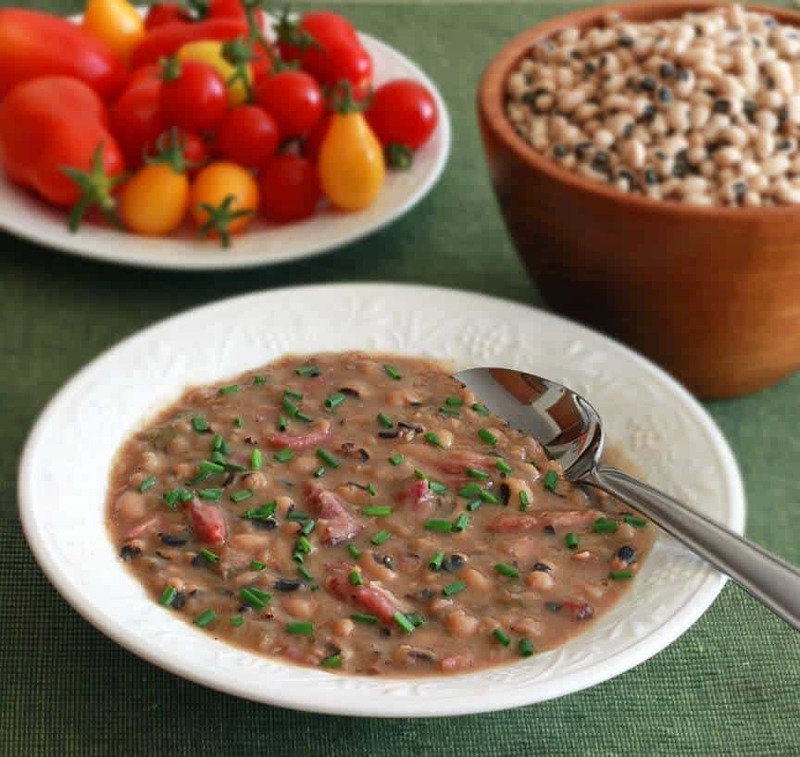 In similar fashion, black-eyed peas are traditionally eaten on Rosh Hashanah, the Jewish new year. Now whether these curious little beans actually bring good luck or not, one thing is certain: They’re delicious! And they’re featured in this smoky soup that will warm both your tummy and your soul. I love Autumn. I love the colors, the smell of damp leaves clustered on the ground, the serenity that seems to fill the air, and I love the cool weather that makes coming home to a bowl of hot soup such a comforting thing. 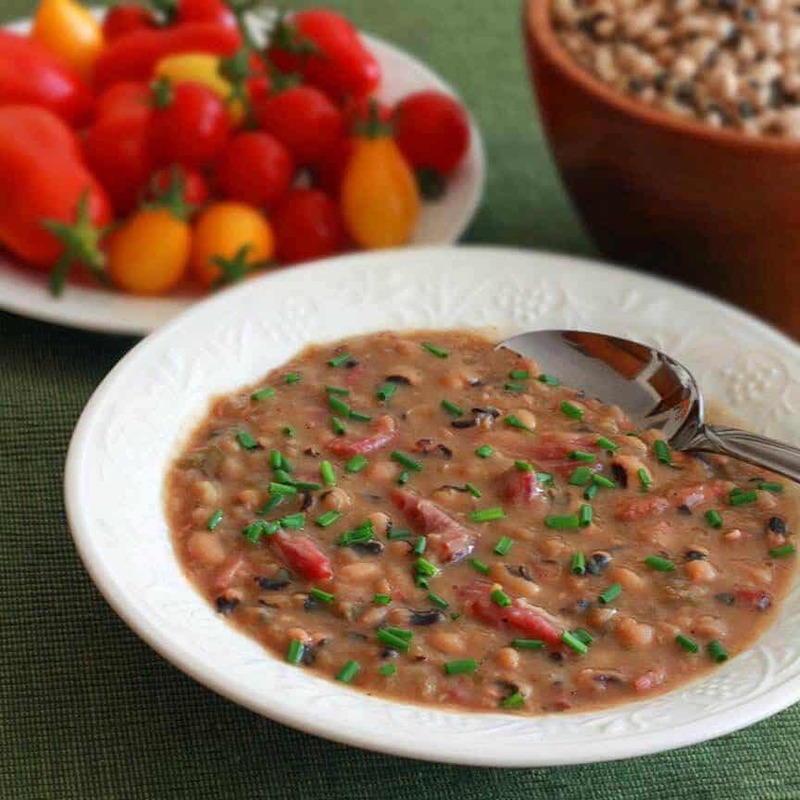 This Smoky Black-eyed Pea and Ham Soup, with its of touch of Southern flair, it’s creamy texture and deeply rich flavor, will become a favorite in your home. Quick and easy to assemble, the Dutch oven does the rest, slowly simmering the soup for 3 hours to ensure optimal flavor. 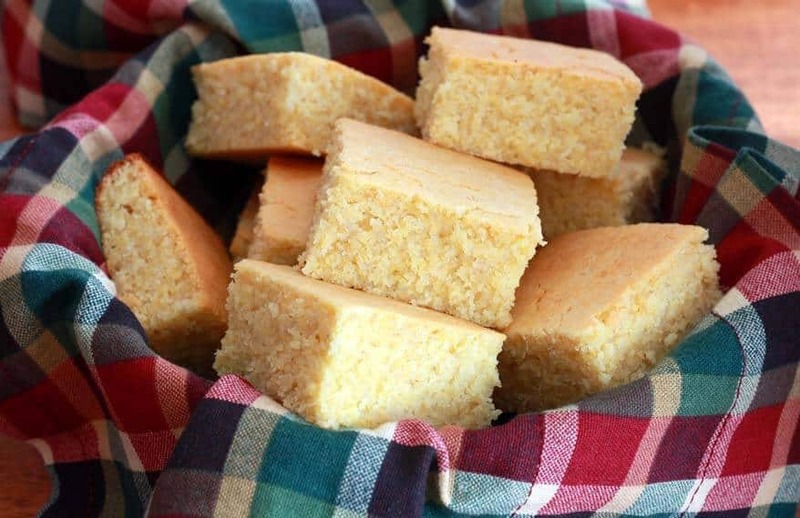 And don’t forget the perfect cornbread to go with it: Delicious Quinoa Cornbread. Traditional flavor, but with added benefits! 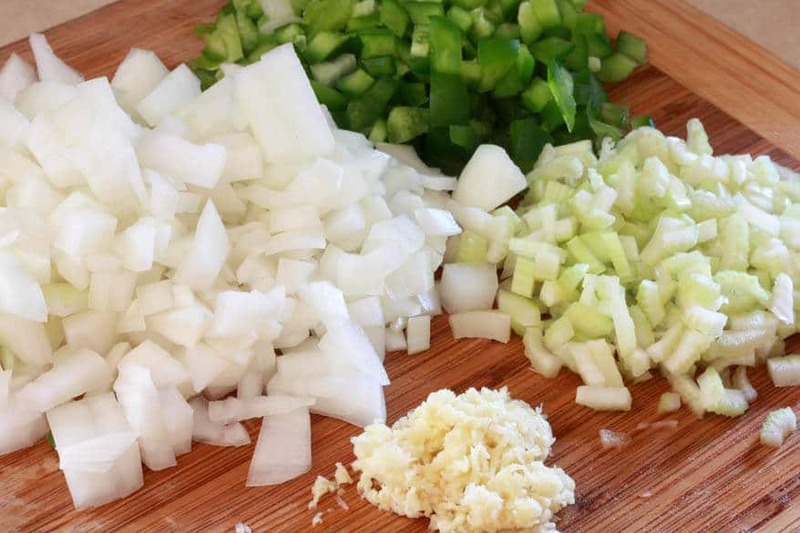 Chop the onions, green bell pepper, celery, and mince the garlic. Heat the olive oil in a Dutch oven (I use and love Lodge) over medium heat, add the veggies and saute until tender, about 4 minutes. Then add the garlic and saute for another minute. While the veggies are cooking, measure out your beans (of course you can do this in advance – I’m just too lazy to switch the pictures), rinse them and pick through them to remove any stones. Add the beans and ham hock to the Dutch oven. I threw in an extra pork neck bone for added flavor (optional). Add the stock, bay leaves and spices. 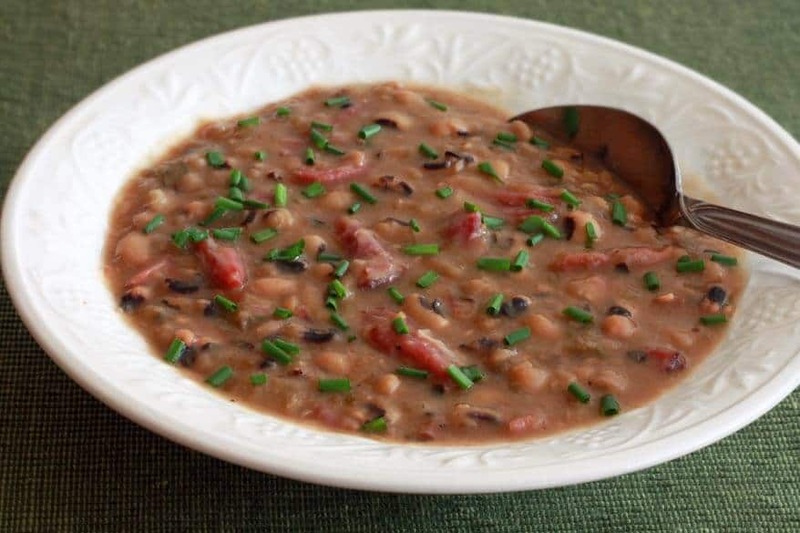 Bring to a boil, reduce the heat to low, cover, and simmer for 2 1/2-3 hours, stirring occasionally, until the beans and ham hock are very tender. Remove the ham hock, pick the meat off and tear into small pieces. Discard the bones and return the meat to the soup. Return the soup to a brief boil. Serve garnished with fresh chopped chives. Enjoy! Heat the olive oil in a Dutch oven over medium-high heat. Add the onions, bell peppers and celery and saute until tender, about 4 minutes. Add the garlic and saute for another minute. 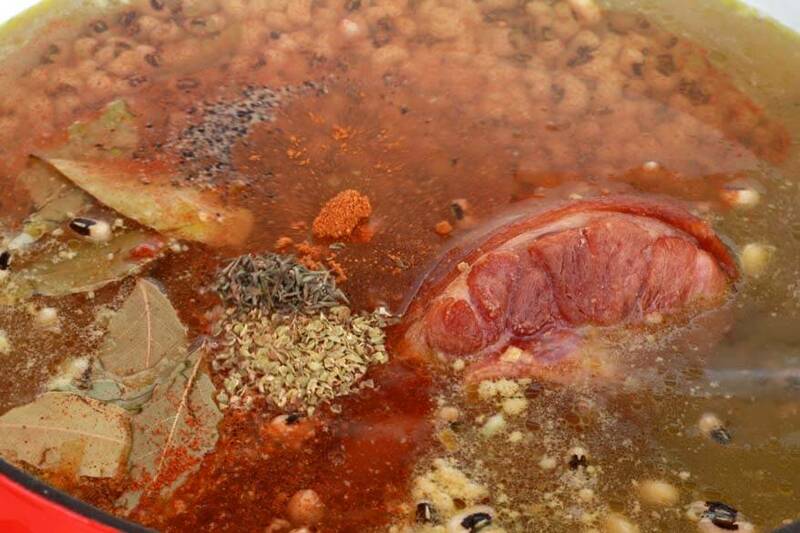 Add the black-eyed peas, ham hock, chicken stock, bay leaves and spices and bring it to a boil. Reduce the heat to low, cover, and simmer for 2½-3 hours, stirring occasionally, until the peas and ham hock are very tender. Remove the ham hock and pick the meat off the bones, tearing it into small pieces. Discard the bones and return the meat to the soup. 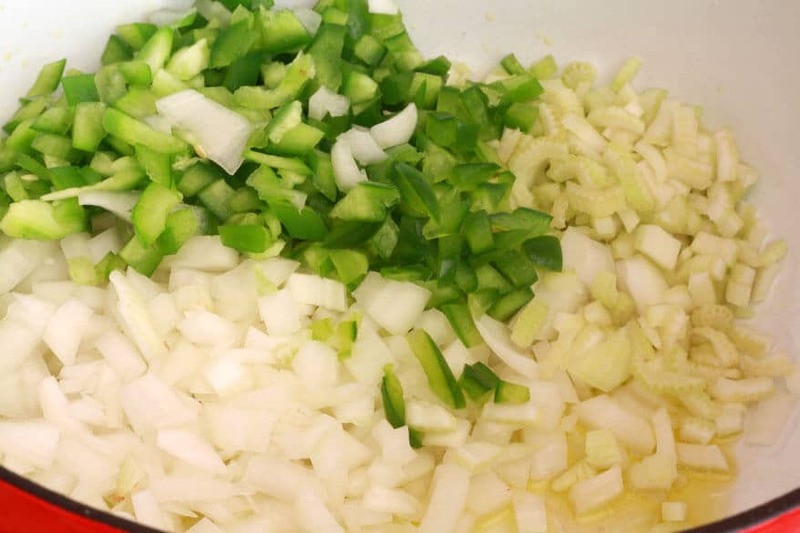 Return the soup to a boil and serve hot, garnished with the fresh chopped chives. 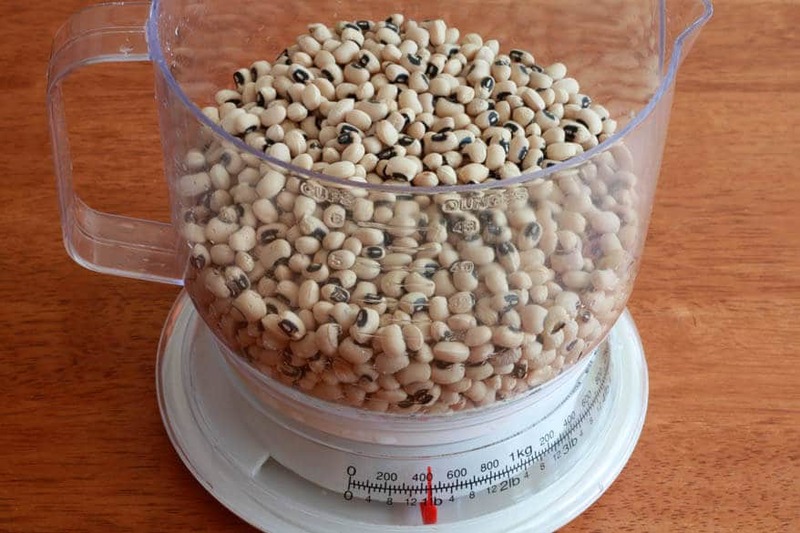 Can you use frozen black eyed peas if you can’t get the dry. If so when do I add them and for how long (It says not to over cook)? Hi Maria, yes you can use frozen and I would add them in during the last 30 minutes or so. That way the rest of the soup with the ham hock can still simmer the full amount of time for maximum flavor. This is exactly what we should have had on New Years! <3 Goodness! It's getting ready to snow here this weekend so many I should make this tonight! While it tastes wonderful, I was trying to figure out why yours is thick and mine thin. Then I realized that I soaked my peas overnight out of habit. I’ll have to try again without soaking the peas. This was FANTASTIC! The flavor is so delicious, everyone had seconds and not a drop was left! I am thinking of making this for New Years but I have a real problem with green peppers. Would it change the flavor character of this soup too much to use red peppers? And will soaking the black-eyed peas cause the soup to not be as thick as yours? Thanks a lot for your reply. Hi Tony, absolutely you can use red. It will taste different but that’s not a bad thing. You can soak the peas if you want to but there’s no reason to. Unlike legumes that take a long time to cook and usually need soak time, black eyed peas don’t and cook much more quickly. Hey, Kimberly, thank you so much for the quick response. I guess my question about the red pepper has to do with disrupting the “Holy Trinity” of onions, celery and green pepper. Will this change the whole character of the dish? I am making and sharing with some southerners so I am a little concerned. If I chopped the green peppers really fine, they may not bother ME so much. I am more concerned that it captures the southern vibe of the dish. What do you think? Hi Toni, for the best – or at least the “right” – flavor yes, I recommend the green bell pepper. If you’re able to tolerate it ;) If not, go with red but yes, it will change the flavor of the soup (but will still taste awesome). Thanks so much! 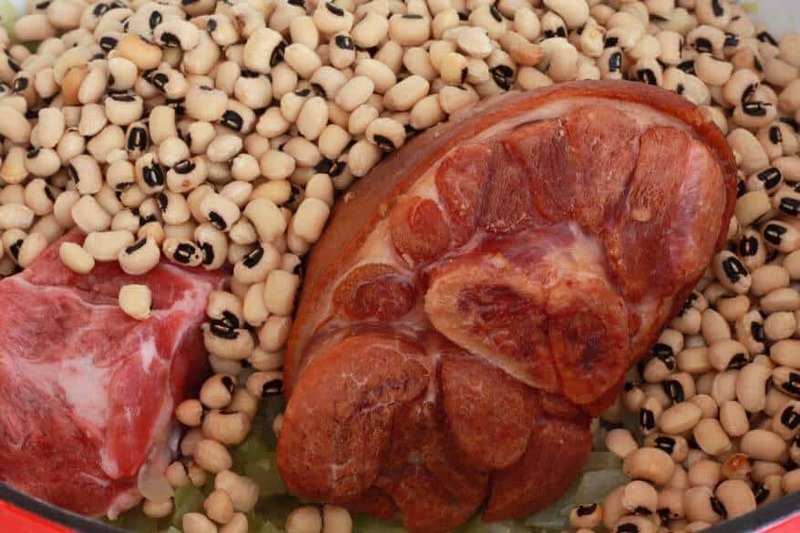 I am really looking forward to making this especially since my mother always made black-eyed peas on New Year’s Eve. I really don’t remember how she made it and she is not around to ask anymore. It is a good tradition to continue. Thanks so much for sharing. Welcome! 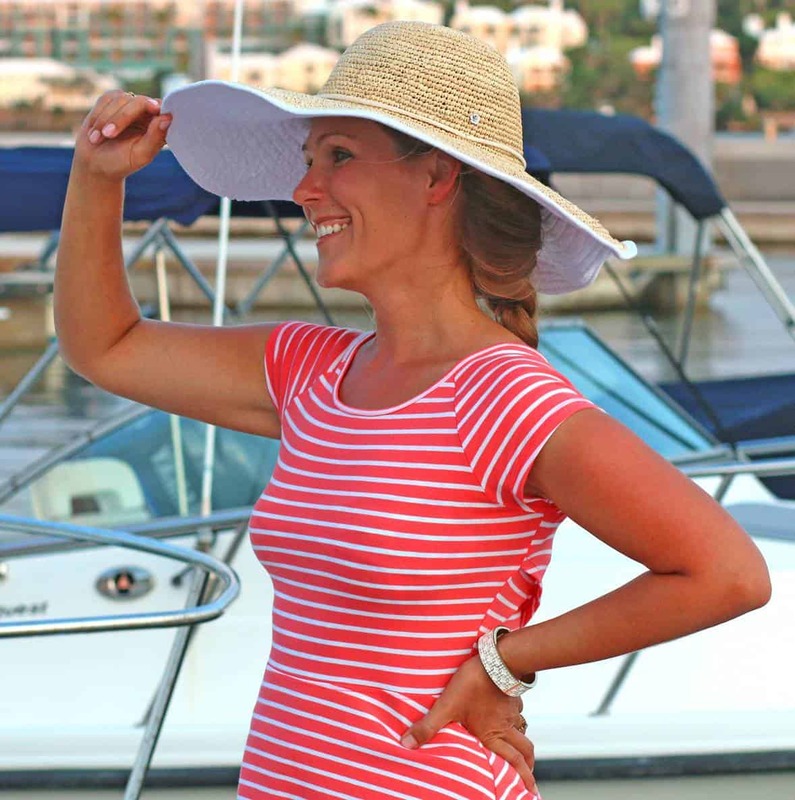 I’m Kimberly and I share delicious originals, revitalized classics and authentic dishes from around the world. Come travel the world through your taste buds! Receive the latest from The Daring Gourmet! Unless otherwise stated, all images, content and recipes are original and are the sole property of Kimberly Killebrew, daringgourmet.com. No photographs or other content may be used without prior written consent. Receive the latest recipes from The Daring Gourmet!